And here we are again, talking about the most famous secret agent in the world! Definitely one of the best resolutions ever at Simplyreaders has been to go through all Bond's novels, starting with Fleming's ones. This time, Bond will visit Harlem in USA and had some sunny time at Jamaica, unfortunately not for leisure purposes. He must infiltrate and destroy a dangerous cel led by Mr. Big, a big capo supported by SMERSH and with a lot of power and money. Never before in his life had there been so much to play for. The cover of Bond will not last long and is matter of time that Mr. Big will start a thrilling and full of action chase. Fortunately for the MI6 field agent, he will have an unexpected ally, Solitaire, being handsome pays off, after all. Keep an eye on: the fantastic descriptions of the places, such as Harlem or the train carriages. As usual, don't miss the chance to read about the taste of Bond on cars, food and, of course, women. If you look for a classic of espionage involving a lot of american old style mafia and a touch of regal, this is the correct book to pick on! I have another motto. 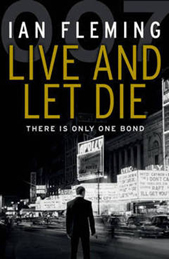 It's "live and let die".